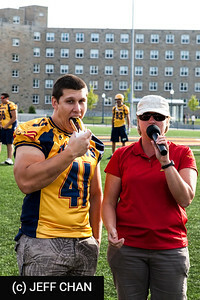 Photos from the Meet the Gaels Rally on September 11, 2009 and game 2, Military Family Appreciation Day, with the McMaster University Marauders vs. Queen's at Richardson Stadium, Kingston, ON on September 12, 2009. 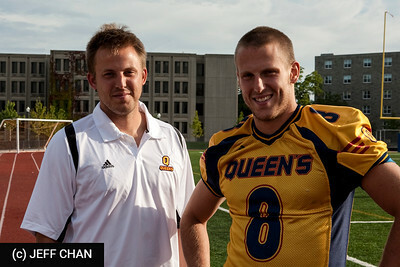 QUEEN'S 8, McMASTER 7 ... No, that's not a misprint! 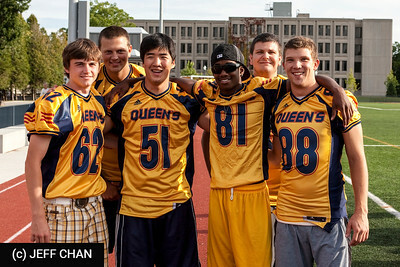 The Queen’s Golden Gaels lost star quarterback Danny Brannagan, but still managed to win a key football game. One week after giving up 49 points in a season-opening three-point win, the Gaels defence bounced back with authority as Queen’s beat the McMaster Marauders 8-7 before a crowd of 2,378 at Richardson Stadium. 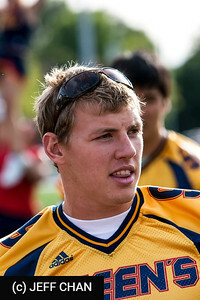 Brannagan suffered a mild concussion in the second quarter after being hit hard by Marauders linebacker Justin Vince . 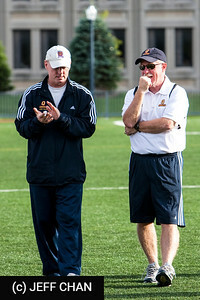 But the Queen’s defence stepped up in the final minute, stopping Mac at midfield after the Gaels turned it over on downs. Brannagan, meanwhile, was scrambling before he was tackled near the sidelines on the play that caused the injury. He got up but then went to a knee. He walked off the field and went to the dressing room with team medical staff. 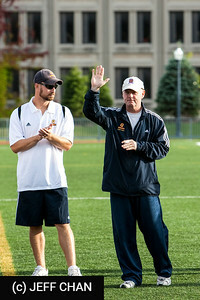 Brannagan was making his 33rd consecutive start for the Gaels. Brannagan returned to the sidelines in street clothes in the fourth quarter. Brannagan was replaced by rookie Justin Chapdelaine, who struggled before being removed in favour of third-stringer Tom Howes, who completed some huge passes down the stretch. 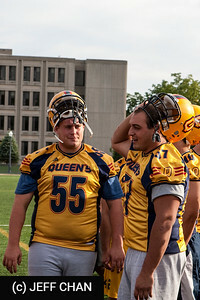 On Howes’ first play early in the fourth quarter, his handoff to Jimmy Therrien was fumbled, giving the ball to Mac at the Queen’s 35-yard line. However, Mac went two and out. 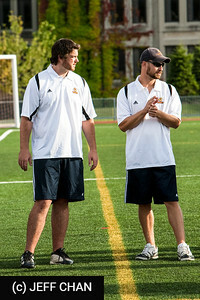 The Gaels broke from the Canadian university football norm, dressing two kickers/punters. 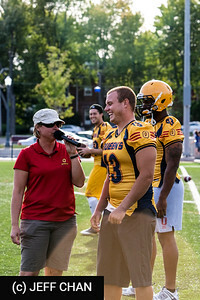 Regular kicker Dan Village, who missed the season opener Monday with a sprained ankle, dressed along with Mike Petranovic, who nailed a last-play 37-yard field goal in the opening game. 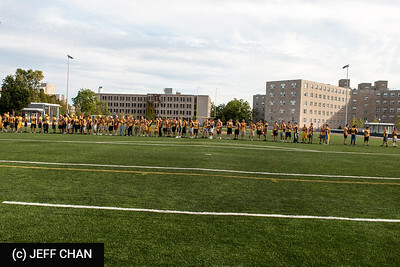 The Gaels started with Petranovic taking field goals and kickoffs and Village punting. 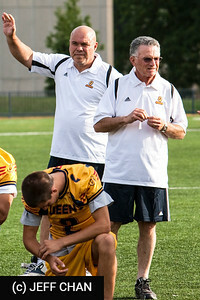 But after Petranovic missed the first two field goals, Village took over that role. The Gaels led 7-6 at halftime. 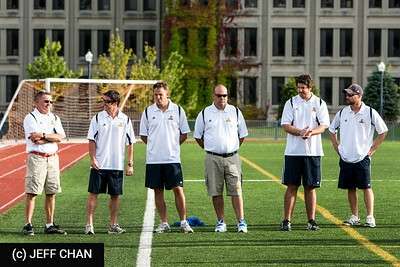 Queen’s coach/offensive co-ordinator Pat Sheahan did a great job of establishing the run early. 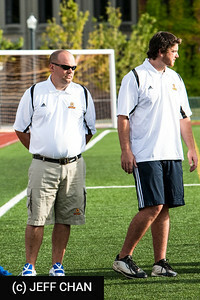 Therrien carried the ball 16 times for 124 yards in the first half as the Gaels employed a balanced offence. Brannagan hit Chris Ioannides for a one-yard touchdown pass to give the Gaels a 7-0 lead on the home team’s second drive of the game. The drive started from the Queen’s 29-yard line. Therrien touched the ball on seven of 12 plays. Mac battled back to hit two field goals in the second half. 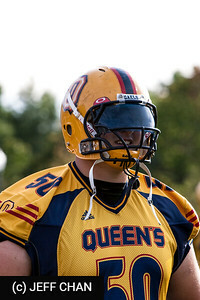 Andrew Waugh connected from 24 and 38 yards to cut the Queen’s lead to one at the break. 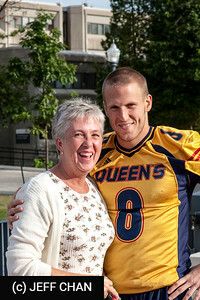 Queen’s added a single on a Village missed field goal in the third quarter to make it 8-6. 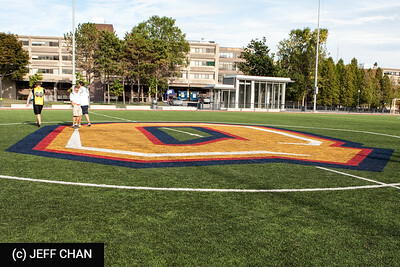 From Queen's Athletics: The No. 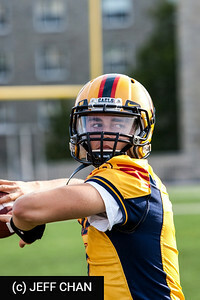 7 Queen’s Gaels (2-0) held the McMaster Marauders (1-1) to a total of 158 offensive yards as the Gaels edged the Marauders 8-7 on Saturday afternoon at Richardson Stadium. Jimmy Therrien of Montreal rushed for career high 181-yards carrying the ball 29 times in the Gaels win. 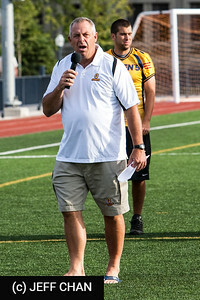 Danny Brannagan of Burlington, Ont., threw the game’s only touchdown to Chris Ioannides of Toronto before leaving the game with an injury mid-way through the second quarter. With Brannagan on the sidelines, the Gaels’ defensive unit suffocated McMaster’s offense from that point on relinquishing only a single point in the fourth quarter. After the rouge which pulled McMaster back to within a single point, the game came down to the final couple of possessions. With under four-minutes to play in the game, McMaster appeared to get inside the Gaels red zone with a great reception from WR Sean Fahey of Mississauga, Ont., but a costly McMaster penalty would wipe out the gain. The Marauders would not get another chance as the Gaels defense held up and preserved their second close win of the season. Linebacker T.J. Leeper of London, Ont., who played a big role in the Gaels defensive effort recording 4.5 tackles, said the defense was out to make a point against McMaster. 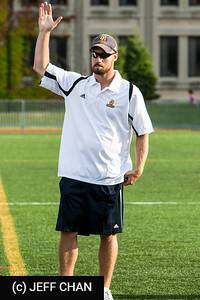 Following the game head coach Pat Sheahan awarded the game ball to the entire defensive unit. 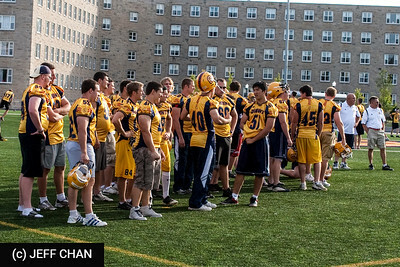 Next week, the Gaels travel to the nation’s capital to battle the Ottawa Gee Gees on September 19. Kickoff is scheduled for 1:00 pm at Frank Clair Stadium. 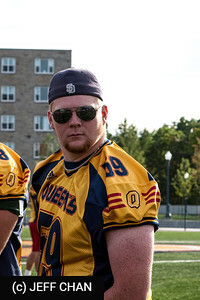 Ottawa upset the Gaels in the playoffs last year. 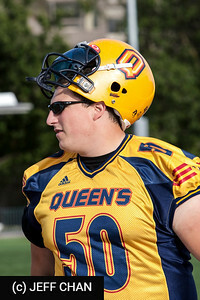 Notes: Chris Smith’s (Toronto) first quarter interception was the Gaels first of the season…QB Justin Chapdelaine (Abbotsford, B.C.) completed his first CIS pass to Blaise Morrison (Bedford, N.S) for a first down in the 2nd quarter… Therrien’s 181 rushing yards were a single-game career high…Therrien’s previous high of 75 rushing yards came again York on Oct. 4, 2008 …Attendance at the game was 2,378. 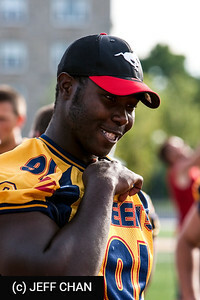 All photos are Copyright (c) Jeff Chan 2000-2009, but may be used for personal non-commercial use, and by Queen's University, the CIS and its member conferences, and by the Vanier Cup, so long as photo credits are shown or the photos are otherwise attributed to Jeff Chan. All other rights are reserved.